Extremadura - an autonomous community of Spain. It includes the provinces of Cáceres and Badajoz. Some important cities are Cáceres, Badajoz, Plasencia and Mérida, the capital of the autonomous community. Extremadura borders Portugal to the west. It is an important area for wildlife, particularly with the major reserve at Monfragüe. Badajoz and Cáceres are, respectively, the largest and second-largest provinces of Spain. 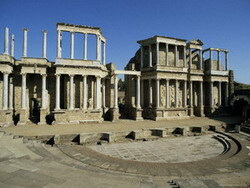 The area contains some fascinating Roman ruins, especially at Mérida. Badajoz - A city on the Guadiana River near the Portugal border. In the province of Badajoz, bordering on the north with Cáceres, on the south with Andalucía (the provinces of Córdoba, Sevilla and Huelva), east with the lands of Castilla La Mancha, and on the west with the neighboring lands of Alentejo in Portugal. An ancient fortress city, it rose to prominence under the Moors as the seat (1022–1094) of a vast independent emirate. The AC Badajoz is a low-rise modern hotel with chic interiors located in the suburbs of Badajoz, five kilometres from the buzzing nightlife of the city centre, and two kilometres from the Portuguese border. The hotel restaurant serves a fusion of Spanish, Portuguese and international tastes, served at breakfast and dinner in a stylish eatery. Decor includes contemporary dark wood furniture, paneled walls and olive green booths. Guests can combat the excesses of the Spanish culinary experience in the fitness centre, or unwind in a decadent Turkish bath or sauna. Six high tech conference rooms seating up to 102 people, accompanied by comprehensive business services, see to business travellers' needs. In between meetings, guests can get their caffeine fix in the ultramodern lobby lounge/café while they get up-to-date on current affairs with complimentary newspapers and high-speed Internet connections (surcharge). Badajoz Airport is 10 kilometres from the hotel. 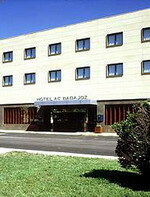 The modern Hotel Badajoz Center, with grey and peach-colored façade, is located in the shopping and business district of Badajoz, 12 kilometers from the airport. 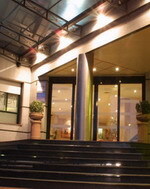 The town's cathedral and the fine art and modern art museums are all within one kilometer of the hotel. Local dishes and international food is served in the relaxed, contemporary ambience of the hotel's restaurant, with its brown walls, table lamps and yellow chairs. The outdoor swimming pool is lined with contemporary loungers and the solarium is the best spot for soaking up some rays. A covered car park is available for guests arriving by car, and six function rooms are provided for social events and conferences, equipped with audio-visual equipment. The 88 air conditioned guestrooms feature chic white décor with burgundy fanbrcis and crisp white bedding; furniture is in contrasting dark wood. This modern, white complex is surrounded by the Guadiana golf course and is located three kilometers from the center of Badajoz, in the region of Extremadura. 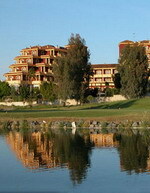 Access can be arranged to the Guadiana golf club next door, which has a gymnasium, sauna and 18-hole golf course. 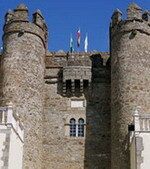 Badajoz center has a variety of shopping and dining options, only 3 kilometers away. In the restaurant, La Cazuela, guests can try local and Mediterranean cuisine and a range of wines served in a relaxed, informal atmosphere with a simple white décor and dark wood furnishings. Guests can have a revitalizing dip in the outdoor pool and play squash or tennis on clay courts. Conference rooms are available for seminars and business meetings. Air-conditioned guestrooms feature a simple white décor with rural-style dark-wood furnishings. All rooms have work desks with complimentary wireless Internet access, private bathrooms with handheld showers and complimentary minibars. The Husa Zurbaran is a five-floor hotel situated in front of Castelar Park in the shopping centre of Badajoz in south-western Spain, close to the Portuguese border. A number of tourist attractions are within walking distance of the hotel including: the Art Museum, which is 400 metres away; the Archaeological Museum, 700 metres away; and Plaza Ayuntamiento Cathedral which is 800 metres from the hotel. Further afield is the Lusiberia Aquatic Park which is 3.5 kilometres away. Badajoz Airport is 12 kilometres from the hotel, an approximate driving time of 15 minutes. The hotel's Los Monjes restaurant serves international cuisine with regional specialties in a modern setting. Guests can soak up the sun on the loungers, take a dip in the outdoor pool, and relax with a drink in the bar. 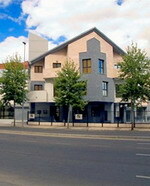 The Hotel Rio Badajoz is located on the banks of the Guadiana River in Badajoz, Spain, close to the Portuguese border. The casino is next door, and the churches and squares of the old town are 800 metres away. The Hotel has an outdoor pool with a poolside bar. There is a mahogany bar and reading room, and secure parking is complimentary. La Alacena Restaurant, with its mahogany-clad walls, specialises in Portuguese cooking. There is a convention centre with several meeting spaces, the largest of which can accommodate up to 1,000 persons. A babysitting service is offered at the hotel. There is also a regular bingo night. The 101 air-conditioned guestrooms are have modern Mediterranean decor, and carved dark wood furnishings. Amenities include satellite television, direct-dial phones, Internet access, and minibars. Zafra - One of the most interesting stopovers in lower Extremadura, the white-walled town of Zafra is filled with old Moorish streets and squares. The 1457 castle of the dukes of Feria, the most important in the province, boasts both a sumptuous 16th-century Herreran patio and the Sala Dorada with its richly paneled ceiling - this building has now been converted into a Parador - details below. The Hotel "Duque de Feria" in Zafra occupies a majestic castle which was begun in 1437 as the residence of the Dukes of Feria, one of Spain’s great families. The spectacular façade expresses the importance of this castle-palace, which is the ideal base for exploring the architectural heritage and the natural beauties of the area. Nine towers with battlements stand guard over a regal, grandiose interior which conserves beautiful coffered ceilings, trunks, ironwork, balustrades and other decorative details from the former palace. The bedrooms, which still have their ducal coffered ceilings and decorative details, are lordly, elegant and spacious. The swimming pool and well-tended garden are also worth a mention. The best local dishes are offered in the dining room of the Parador de Zafra, such as caldereta de cordero (lamb stew), migas extremeñas (breadcrumbs), bacalao monacal (cod), zorongollo (tomato salad), cheesecake from La Serena, Iberian pork loin with Ibores cheese, and, of course, ham. This palace, in the heart of the emblematic and majestic town of Zafra known as “mini” Seville, was once the residence of Don Agustín Mendoza y Montero, Count of the Court and owner of cattle of the same name. The interior patio is used as a hallway leading to the different common areas and the breakfast room. 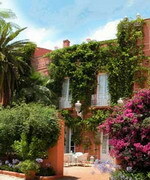 Another charming space is the garden with swimming pool with Victorian style furniture creating different atmospheres. The rooms of this hotel, taking inspiration from the world of bull fighting, are each named after prestigious cattle rearing families. Spacious, they all convey a classical, palatial feel with quality English style fabrics used for the curtains and bedcovers. The large bathrooms with high ceilings are colourful and original as is the shower that simulates a 19th century bird cage.